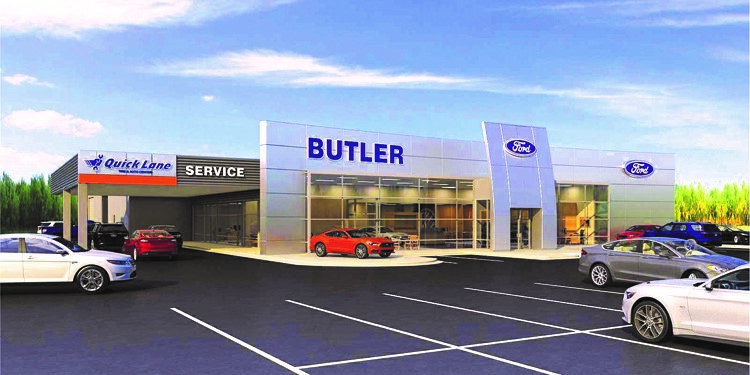 ASHLAND, OR– Butler Ford began a new chapter in its history, as construction started on a state-of-the-art Ford showroom at 1977 Highway 99 North, where the current Ford store has been located for over 38 years. This marks the greatest change of scenery at Butler Ford since founders Chuck and Linda Butler moved their dealership from downtown Ashland to Highway 99 in 1977. The Butlers set up shop in Ashland a year earlier and have been an integral part of the Southern Oregon community ever since. Construction is scheduled to be completed in spring of 2016. Butler Ford is located in beautiful Ashland, Oregon, and is one of four dealerships that make up Butler Automotive Group. Chuck and Linda Butler opened Butler Ford in 1976, and their dealerships, service centers, and rental agency now employ over 100 people at locations in Ashland and Medford. Butler Automotive Group is proud to support over 35 community organizations, as well as nationally recognized organizations like Susan G. Komen for the Cure.